Detroit the Next Fashion Capital? NPR Thinks So! NBC Nightly News Covers the "Motor City Comeback"
Hard Rock Cafe Detroit is giving local bands the opportunity to perform at London’s Hyde Park for Hard Rock Calling 2011, one of the world’s most iconic music festivals. 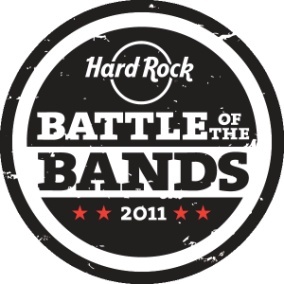 On March 11, 2011, Hard Rock Cafe Detroit will host a local round of Hard Rock’s Battle of the Bands, where area artists will compete live and be evaluated by a panel of local celebs and area music professionals. Judges for the battle include Melody Baetens, musician, entertainment writer for The Detroit News and co-owner of Small’s restaurant, Aimee Spencer, local event coordinator, music producer and owner of Spencer Ink and others to be announced. A panel of acclaimed industry experts, including Little Steven Van Zandt of the legendary E Street Band, Pete Wentz of Fall Out Boy, Live Nation Vice President of Promotions Toby Leighton-Pope, Hard Rock International Chief Marketing Officer John Galloway and Absolute Radio Director of Marketing Clare Baker, will help narrow down the choices from across the globe. The top bands will then be posted on www.hardrock.com, and their fate put in the hands of rock fans worldwide who will vote on their favorites. Four finalists will be flown to London and given a spot on the bill at Hard Rock Calling 2011 in London’s Hyde Park. The band that receives the most votes will take the Main Stage at Hard Rock Calling, with the runners-up rockin’ out on the Second Stage. With thousands of fans and top headliners, including Bon Jovi, Hard Rock Calling 2011 is the chance of a lifetime for emerging artists to gain exposure and showcase their talent in front of rock royalty. Email detroit_sales@hardrock.com for more information. London! There will definitely be a lot of local bands who will participate in Hard Rock Cafe. If I have a band of my own, I will also participate. I would like to go to London for free.